Being that Cognac is the world’s favorite brandy, it would make sense, so you’d think, for it to be the national drink of the country that creates it. But actually, nothing could be further from the truth. So what the most popular drink in France? Perhaps Wine? After all, France is also famous for its wine production, as well as its Cognac. However, this isn’t the case either. Because the drink that the French are head over heels in love with is none other than whisky. Surprised? Well let’s take a look at the reasons behind what many may think is a rather strange phenomenon. We need to head back to the eleventh century to begin to discover where the story begins. It was during this time that it was discovered that it was possible to distil wine for transportation. This meant it took up less room, and could be shipped from France to other countries. The first people to do this were Dutch wine merchants. This brandwijn was only meant to be a means for transportation. But it didn’t take long before it was discovered to be a rather lovely drink in its own right. The name ‘brandy’ was thence born, which would eventually become known as Cognac. Find out more about these fascinating roots of Cognac in our post about the Complete History of Cognac. Over the centuries this trade became the mainstay of wine growers in the Cognac region. They created their brandy for exportation. Very little was consumed at home, as this was a product that the wine makers could sell for good profit. This international trade became a historical priority. And over the past 20 or 30 years, this luxury item has become a booming sector of the French economy. According to the research article, What Determines Exports for Luxury Products? The Case of Cognac, over 95% of the total Cognac production is exported each and every year. It’s bought in over 120 countries around the world. And being as Cognac can only be made in limited amounts, the French understandably sell it, as it’s worth so much to the economy. … And Cognac is the drink of the Pacific, so said Francois Heriard-Debreuil, the president of Remy & Associes, back in 1988. And today this remains true to a point, with Asia being the largest importer of Cognac when it comes to value. Although the US is the largest importer when it comes to volume. According to an in depth study carried out by Paris based consultancy firm, Bonial, the French actually drink almost as much whisky in volume as Cognac they export. And the volume of whisky consumed by each person in France on an annual basis is an average of 2.15 liters per year. This is greater than any other country in the world. The closest competitors are those from Uruguay, who consume 1.77 liters per year, and Americans, who swallow down 1.4 liters per head. This adds up to 140 million liters of whisky purchased by the French per year, Or the amount of liquid that it would take to fill 45 Olympic size swimming pools. Now that’s a lot of whisky, in anyone’s book. When you look at the infographic for consumption of spirits in France, whisky accounts for almost 40% of all sales. The aniseed drinks, such as Pastis, account for 21.9%, rum is about 11.3%, white spirits are 10.2%, liqueurs at 8.9%,bitters at 4.8%, cocktails and ready made drinks such as punches and cocktails at 2%, and then the brandies of Cognac at 0.5%, Armagnac at 0.2%, and Calvados at 0.2%. 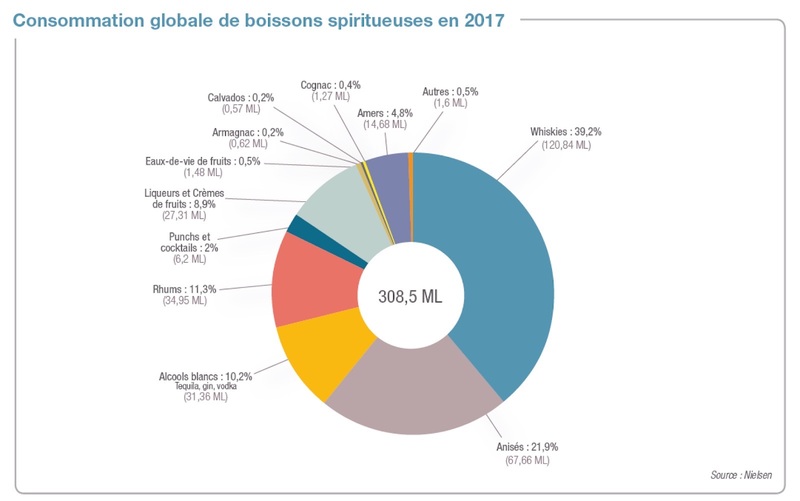 Overall consumption of spirits in France, 2017. And while the French truly have a love affair with Scotch whisky, this current trend could well be set to change. Because if there’s one thing the French are known for, it’s their penchant for buying home grown goods. French-made whisky is a burgeoning industry in France, with many being typically ‘craft’ brands, something that spirit drinkers around the world are tuning into in a big way. There are many very good French whiskies. 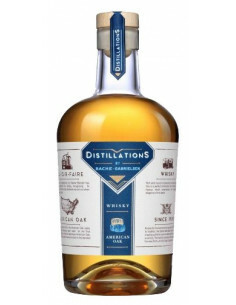 And the selection is only set to increase as more quality distillers bring products to market. Some of the bigger players include Glann ar More in Brittany, Grallet-Dupic in Lorraine, and Guillon in the Champagne region. 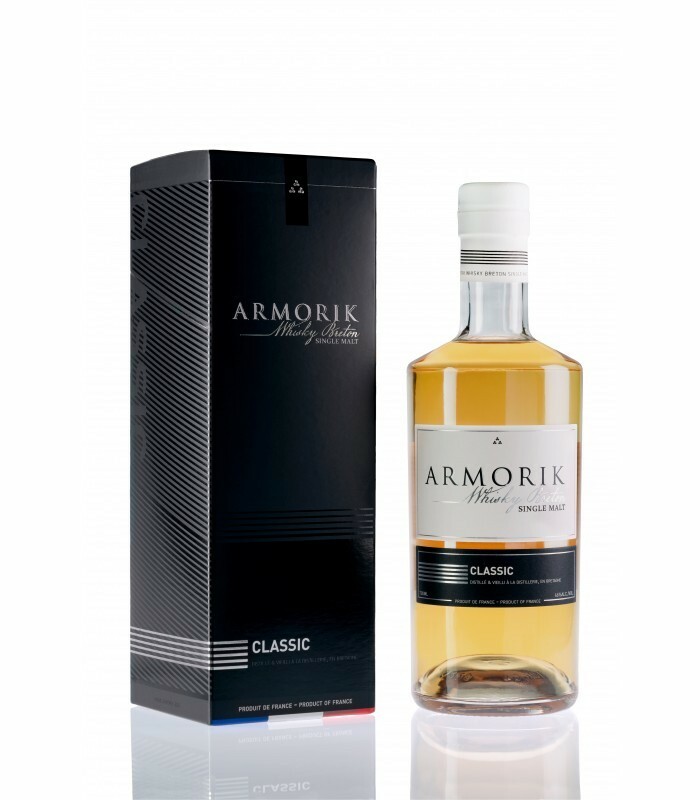 The first ever single malt French whisky was produced in 1998 by the Warenghem distillery in Brittany. In 2015, both Brittany and the region of Alsace were both declared official whisky producing regions. The names, ‘Le Whisky Breton’ and “Le Whisky Alsacien’ have both been granted official status. In addition, many established fruit eaux-de-vie distilleries have also diversified into whisky production. In true French style, Nicolas Julhes, head of the Distillerie de Paris, has said, “Within 15 years the world’s best whiskies will be French. We will be able to stop copying the Scots and bring a real French style. We have the greatest specialists on aging who have always worked in wine and Cognac”. Now that, you have to admit, is fighting talk. One reason is due to its relatively low price. And whilst the French do indeed love Scotch Malts, guess what the best selling whisky in the country is right now? 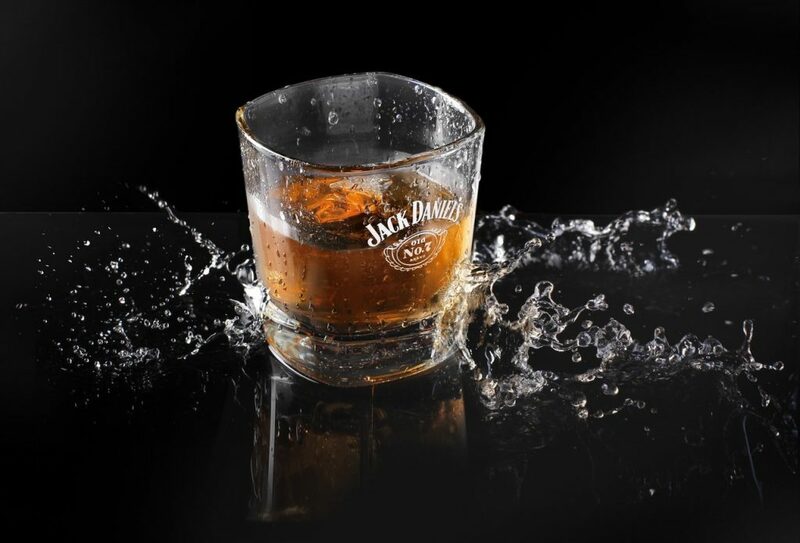 None other than Jack Daniel’s. However, over recent times it appears that more and more people are sampling the rarer and more expensive brands of whisky, so that may not continue to be true over the coming years. Even though Cognac is home grown, it’s still relatively more expensive than other liquors such as Whisky. In addition, when the phylloxera bug decimated the French vineyards in the mid nineteenth century, Scotch became the replacement liquor of choice. And France’s love affair with whisky has never since abated. 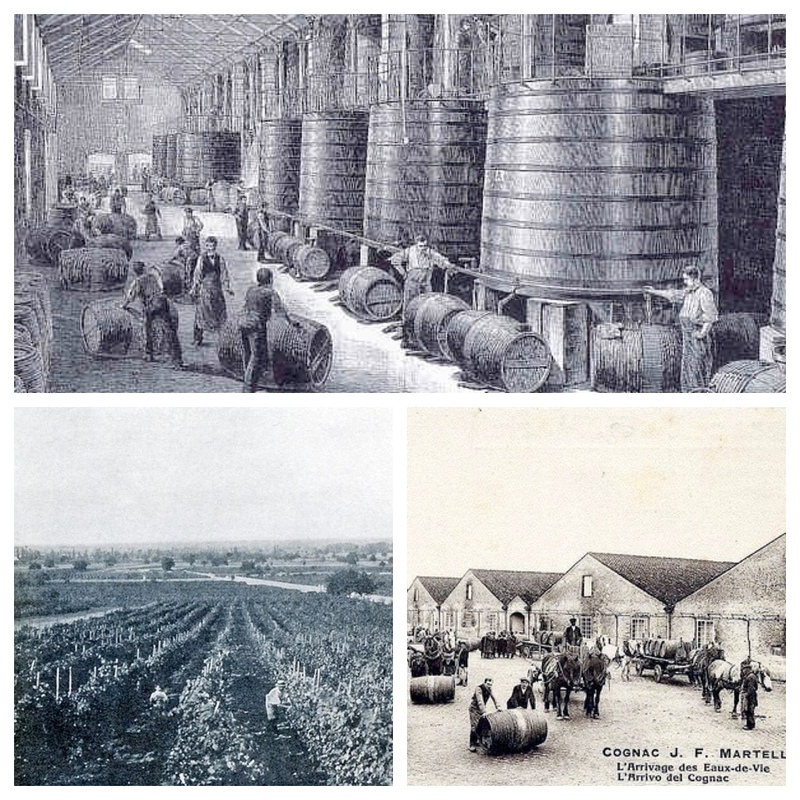 Discover more about this catastrophic event that changed the history of the French vineyards forever in our article about the impact of the tiny insect, Phylloxera, on the Cognac industry. In France the image of Cognac is still old and provincial, despite this being very much the opposite in most other countries of the world. 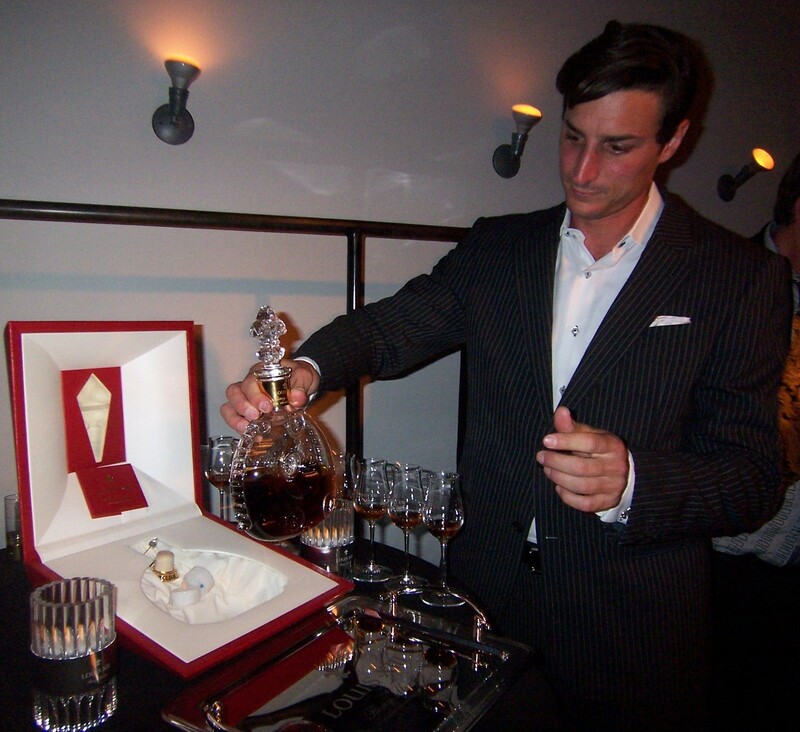 For example, in China, Cognac is seen as the ultimate expression of luxury, and in the US it became a symbol for hip hop music and urban communities. Pass The Courvoisier – A hit by Busta Rhymes, the American hip hop/rap artist. Moreover, when it comes to whisky consumption by country, the French drink more whisky per head than any other nation in the world. And home grown French whisky production is on the up. Will they ever overtake the Scots as the creators of what is widely believed to be the best whisky in the world? That fact remains yet to be seen. But competition is a good thing, whatever the product and wherever it’s created. And it certainly makes for interesting times ahead, that’s for sure. We’ll watch with interest and see how this pans out. So there you have it. The French export almost all of their Cognac overseas, and always have done. And Cognac is certainly not the national drink of France. That accolade actually goes to Pastis, the strong aniseed flavored liquor. 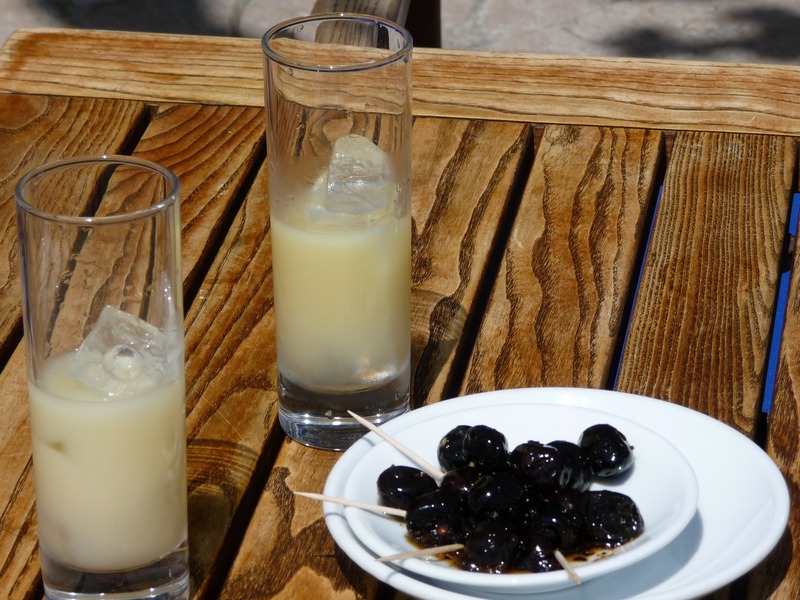 Glasses of pastis served with a plate of olives.